The beautiful Monarch butterfly – possibly America’s best-known butterfly – is being considered for “endangered”status under the Endangered Species Act. Meanwhile, we’re cutting down the trees these creatures depend on. Nativist myths are partly responsible. There are two migrations of these butterflies: East of the Rockies, these butterflies migrate between Mexico and the northern part of America. On the Western side, they migrate between the interior and the coast. These are the butterflies we see in California. The Eastern migration is threatened mainly by a lack of milkweed, their nursery plant, as farmers efficiently exterminate the “weed.” But the Western migration is threatened by something different – a steady reduction in wintering sites as the war on eucalyptus trees continues. On Treasure Island, where Monarchs have been known to over-winter in some years, hundreds if not thousands of trees are being cut down. We think the article below is an important one. It’s republished with permission from “Death of a Million Trees.” Recognizing the truth will help us save these beautiful creatures. Debunking the myths of nativism—especially those that justify the eradication of non-native trees—is the task we have assigned ourselves, which requires us to revisit a few of the misconceptions about monarch butterflies in California. 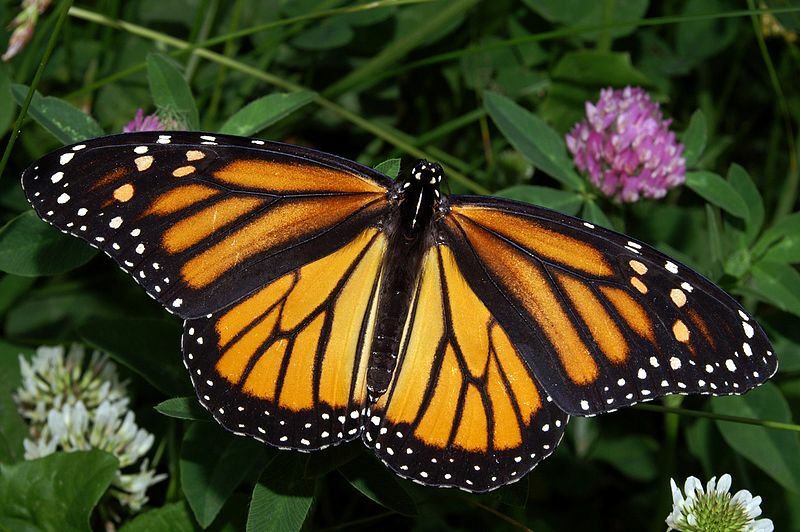 When application for endangered status for monarchs was filed in August 2014, a few new monarch myths emerged and have since been faithfully repeated by native plant advocates who are demanding the eradication of our urban forests. The monarch migration in California is using predominantly non-native trees, which should afford those trees some protection. Unfortunately, it has only produced more convoluted theories that deny the value of non-native plants and trees to monarchs. Myth #1: The California migration of monarch butterflies prefers native trees for their winter roost. Monarch butterflies roosting in eucalyptus tree. Unfortunately, this fact has been obscured by a small study of a few selected sites used by monarchs during their migration. Griffiths and Villanova (2) observed the monarch migration in a few sites in Monterey and San Luis Obispo counties. 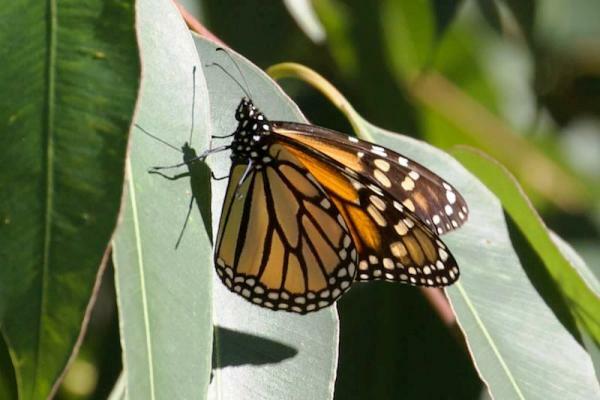 They report that the monarchs moved around among three tree species including eucalyptus, suggesting to them that Monterey pine and cypress are equally important to the monarchs. While we don’t doubt that this may be true, we don’t think we can generalize from this study because it was conducted in the small native range of Monterey pine and cypress. The California migration of monarchs spends the winter months roosting in tall trees in 17 counties along the coast of California, from Mendocino County in the north to San Diego County in the south. (1) Most of that expanse is outside the native range of Monterey pine and cypress. Griffiths and Villanova do not acknowledge that both Monterey pine and cypress are being eradicated outside their native range for the same reason that eucalyptus is being eradicated, i.e., they are considered “alien invaders” where they have been planted outside their native range. Here in the San Francisco Bay area, for example, 500 Monterey pines were destroyed on the Marin headlands a few years ago and an untold number of Monterey pines will be destroyed by the FEMA projects in addition to those that have already been destroyed here. If, in fact, monarchs do have a preference for Monterey pines and cypress for their winter roost, they do not have that option outside of the small native range of those trees in Monterey County. For the record, we should tell you that we are just as opposed to the pointless destruction of Monterey pine and cypress outside their small native range as we are opposed to the destruction of eucalyptus. There is paleontological evidence (fossil cones) that Monterey pines lived in the San Francisco Bay Area several times in the distant past. That finding was reported (4) in Fremontia, the journal of the California Native Plant Society. The author asked that Monterey pines be allowed to remain where they lived in the past because the species is threatened in its small native range. Unfortunately, her advice has been ignored by native plant advocates, who continue to demand that all Monterey pines be destroyed where they have been planted outside their present native range. This extreme viewpoint is one of the reasons why native plant advocates have earned their reputation as fanatics. Myth #2: The California migration of monarch butterflies used exclusively native trees before eucalyptus was planted in California. Myth #3: Non-native species of milkweed is harmful to monarch butterflies. 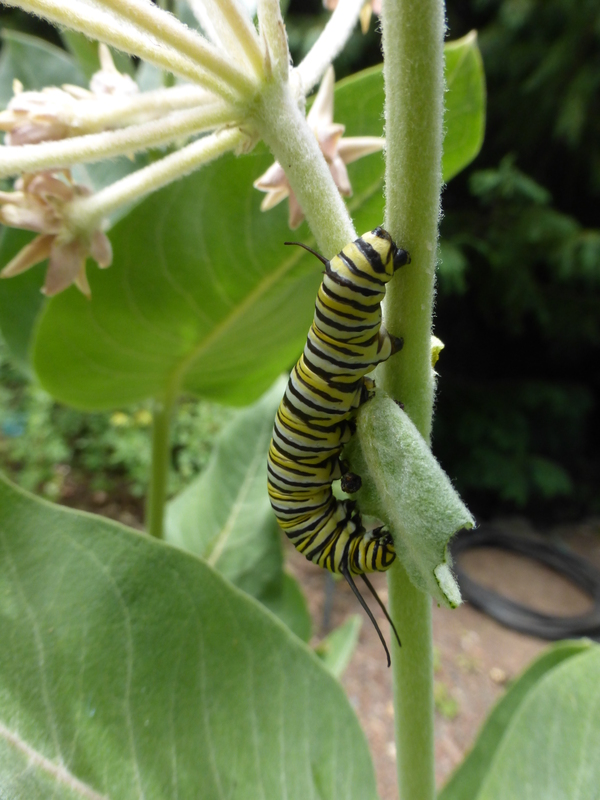 Monarch butterflies lay their eggs on milkweed and their larvae, the caterpillar, feeds exclusively on milkweed. Many native plant advocates believe that the monarch requires a native species of milkweed. They are mistaken in that assumption. Wikipedia lists over 35 species of milkweed (genus Asclepias) all over the world and many are known to be used by the widely dispersed populations of monarchs. The dispersal of monarchs from their original range in North America is approximately 200 years old, according to molecular analysis of populations across the Pacific Ocean (Hawaii, Samoa, Fiji, New Caledonia, New Zealand, Australia) and across the Atlantic (Spain, Portugal, Morocco). These dispersals are assumed to have been aided by human transportation of both milkweeds and monarchs and extreme weather events. 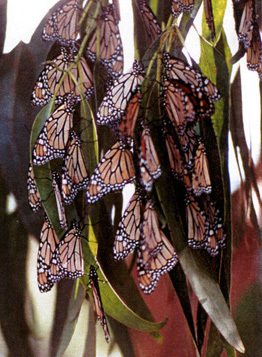 “For example, monarchs were recorded in Australia in 1870 and were most probably carried there on cyclonic winds from a source population in New Caledonia.” (7) These populations do not migrate and are therefore genetically distinct from the ancestral population of North American monarchs as a result of genetic drift. In many of the homes of new populations of monarch butterflies there was no native species of milkweed before being introduced simultaneously with the monarch populations. Although there are numerous members of the milkweed family native to Australia, monarchs do not appear to utilize the native species, preferring the introduced species of milkweed. 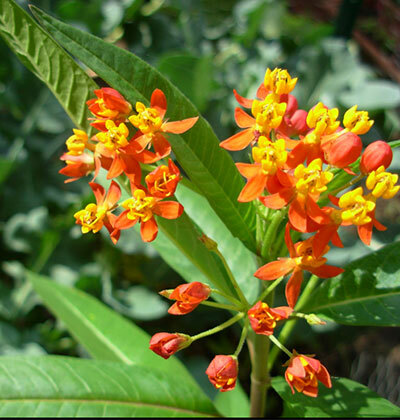 In California, a tropical species of milkweed is popular with gardeners (Asclepias curassavica). Unlike the native species of milkweed, tropical milkweed does not die back in winter. Gardeners therefore tend to prefer the tropical milkweed because it makes a colorful contribution to their gardens year around. Of course, native plant advocates prefer native species of milkweed and they justify their preference by claiming that tropical milkweed is harmful to monarchs. They claim that the monarch parasite (Ophryocystis elektroscirrha) can accumulate on tropical milkweed because it doesn’t die back during the winter. Tropical milkweed is the only milkweed available in winter. The parasite disrupts some winter breeding of monarchs, but that breeding would not occur in the absence of tropical milkweed. If more monarchs are the goal, tropical milkweed is making a contribution to the monarch population. New scientific research bebunks the myth that tropical milkweed is harmful to monarchs. Leiling Tao et.al. (8) studied monarch lifespans when they fed on a variety of milkweed species. They looked at both resistance to monarch parasite (O. elktroscirrha) infection and tolerance once infected. They found a complex interaction between species of milkweed the monarchs fed on and the amount of mycorrhizal fungi on the roots of the milkweed. But one result was clear: monarchs raised on tropical milkweed (A. curassavica) lived as long, or longer than, monarchs raised on other species of milkweed. They were less likely to be infected, and once infected, tolerated the infection well. In short, there is nothing about tropical milkweed as a host that is detrimental to monarch survival in the presence of parasites. Native plant advocates also speculate that tropical milkweed can disrupt the migratory patterns of monarchs because it is available when native milkweed is not available. Given that monarchs have persisted for 200 years all over the world, using exclusively non-native milkweed and without migrating, this seems an unnecessarily pessimistic concern. Neither native milkweed species, nor migration are essential to the survival of monarchs as a species. As we often do on Million Trees, we have taken a peek under the cover story being used by native plant advocates to justify the eradication of non-native plants and trees. Once again, we find a lot of pessimistic speculation, but little evidence that eradicating non-native plants will benefit wildlife, or conversely that wildlife can only survive in native habitat. Yes, it was a tedious journey to that conclusion and we thank you for your patience if you have persevered to our optimistic conclusion that wildlife is far more resourceful and resilient than nativism wishes to believe. (1) Dennis Frey and Andrew Schaffner, “Spatial and Temporal Pattern of Monarch Overwintering Abundance in Western North America,” in The Monarch Butterfly Biology and Conservation, Cornell University Press, 2004. (3) Richard Vane-Wright, “The Columbus Hypothesis: An Explanation for the Dramatic 19th Century Range Expansion of the Monarch Butterfly,” in Biology and Conservation of the Monarch Butterfly,Natural History Museum of Los Angeles County, 1993. (6) Art Shapiro, Field Guide to Butterflies of the San Francisco Bay and Sacramento Valley Regions, California Natural History Guides, UC Press, 2007. (7) Amanda Pierce, et. al., “Serial founder effects and genetic differentiation during worldwide range expansion of monarch butterflies,” Proceedings of the Royal Society of Britain, 281: 2014.2230. (8) LeilingTao, et. al., “Disease ecology across soil boundaries: effects of below-ground fungi on above-ground host—parasite interactions,” Proceedings of Royal Society of Britain, 282: 2015.1993. Wonderful positive article on the Monarchs! Thank you for posting all this scientific information. We need all the hard facts we can get in this era of factoids.